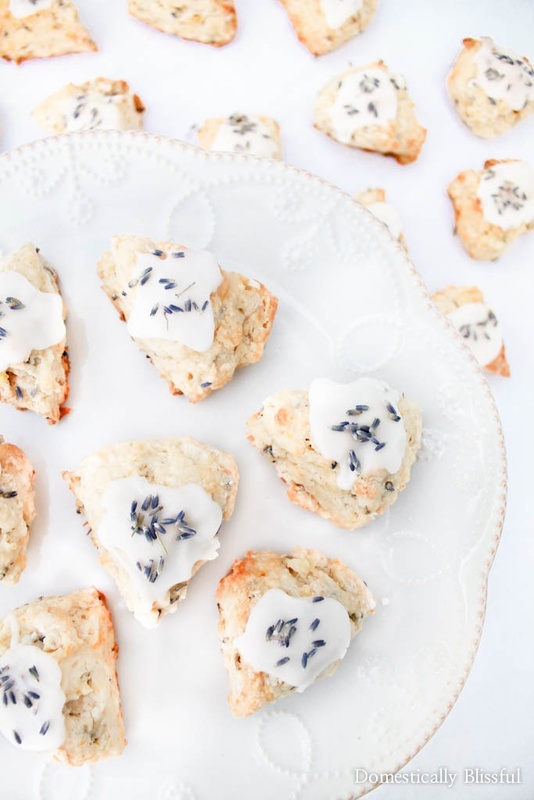 These Lemon Lavender Scones are a sweet little treat that is full of fresh summer & floral flavor for breakfast, brunch, or dessert. I have been dreaming about making Lemon Lavender Scones for a couple of years. It’s one of those recipes that you really want to make, but aren’t sure if you are going to be able to pull it off. A few months ago I tried Chocolate Lavender Ice Cream… And I was extremely disappointed I kept hoping the intense lavender flavor of this ice cream would grow on me, but they had added way too much, at least for my taste. So out of baking fear I held off on creating my own lavender recipes. I finally decided to be adventurous & do it! And I had one simple goal. 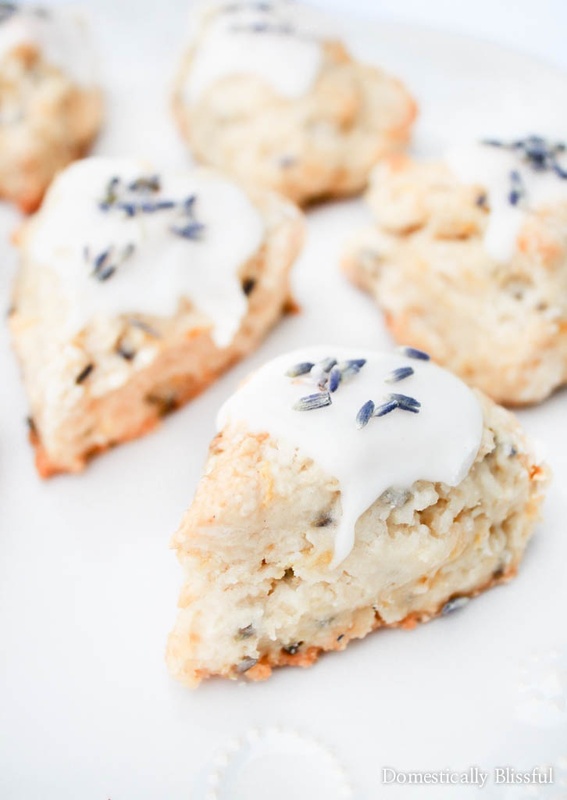 Lots of fresh lemony flavor with a hint of lavender that leaves you wanting to eat more of these delicious Lemon Lavender Scones. I believe I have accomplished my goal, but I’ll let you be the judge of that! 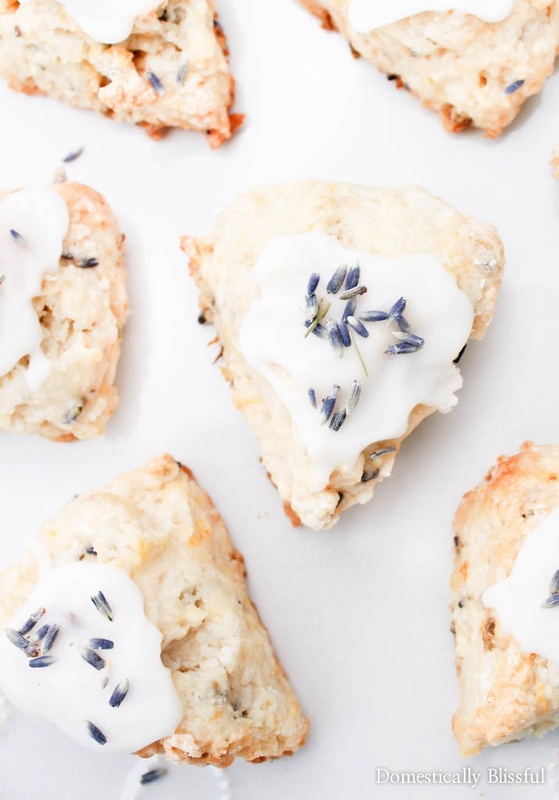 And I’ll admit that it’s super easy to quickly consume a bunch of these Lemon Lavender Scones with your morning cup of coffee, especially because these are mini sized! For some reason, I am addicted to mini scones recently. It feels like I’m eating less, even though I probably eat more because I can’t just eat 1 or 2, more like 3 or 4. 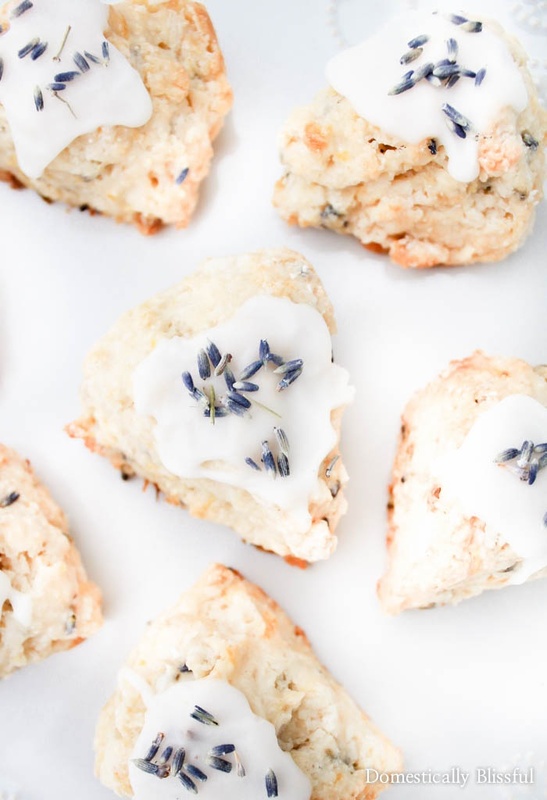 I love these fresh flavors so much I’m thinking about making these Lemon Lavender Scones again really soon & maybe adding some fresh rosemary or maybe poppy seeds! 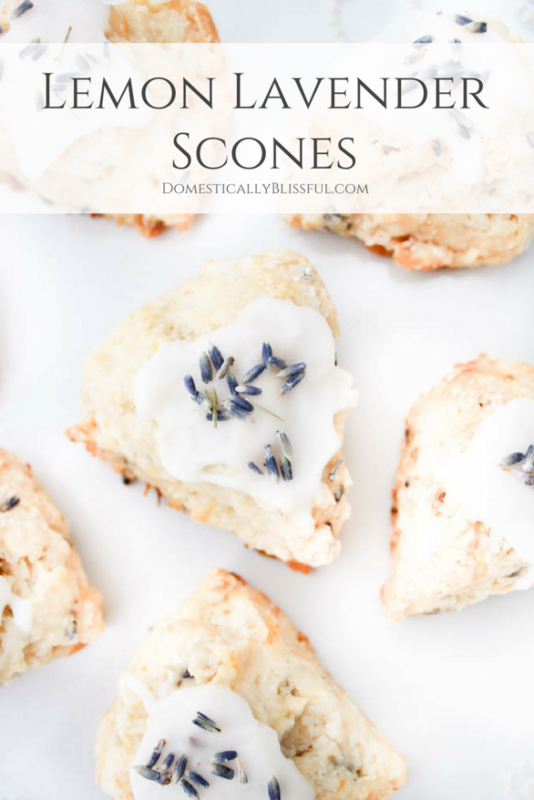 But no matter how many different variations of these Lemon Lavender Scones I make, the one thing that will stay the same is that it pairs perfectly with your morning cup of coffee! 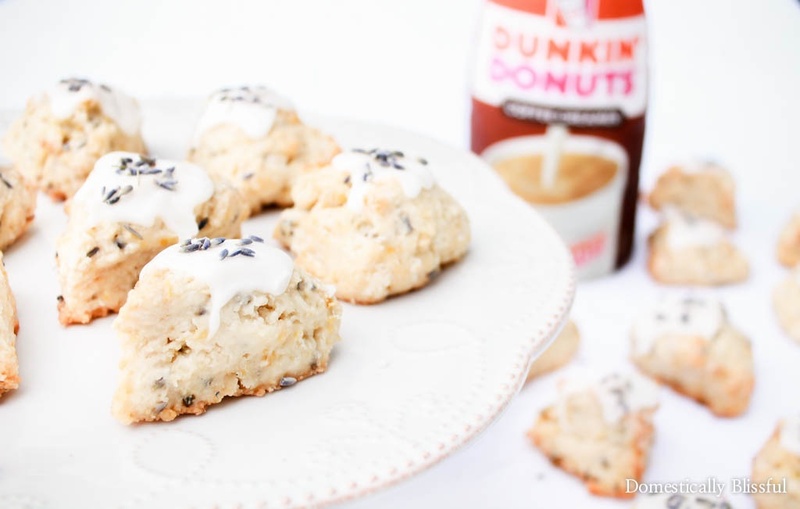 Especially because there is Dunkin’ Donuts® Vanilla Creamer in these Lemon Lavender Scones & Dunkin’ Donuts® Caramel Creamer in my morning cup of coffee! Which I think is a perfect match!! And I’m not sure if I should admit this or not, but the first thing I do when I open a new bottle of Dunkin’ Donuts® Creamer is to lick the extra creamer off of the safety tab. I don’t want a single drop to be lost, it’s just so good! 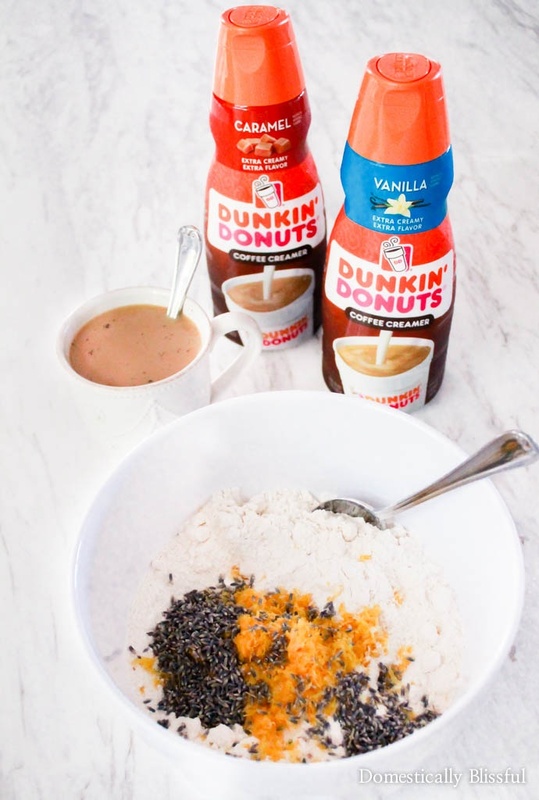 I love how easy it is to enjoy Dunkin’ Donuts® delicious flavors by simply adding them to your daily cup of coffee. It’s the perfect addition! 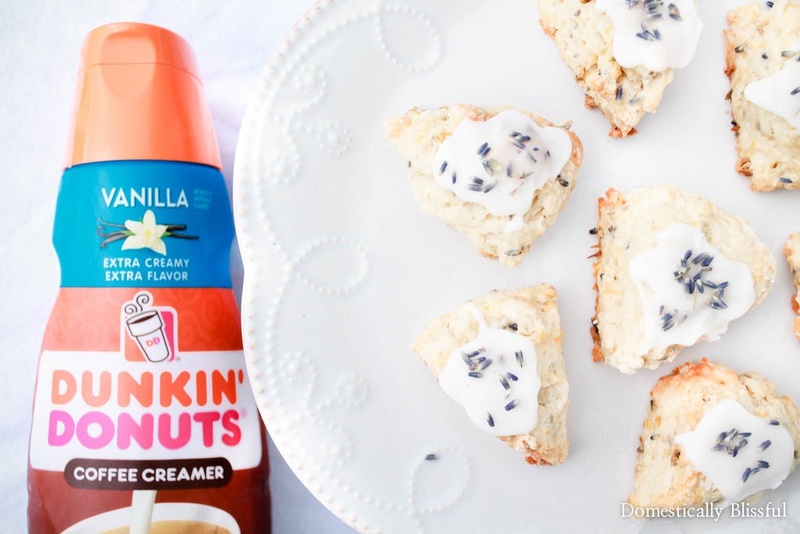 The extra smooth Dunkin’ Donuts® Vanilla Creamer in these Lemon Lavender Scones gives it a rich vanilla flavor. And as you know I can’t get enough caramel, especially this Dunkin’ Donuts® Caramel Creamer which is made with only real cane sugar for an authentic caramel taste. 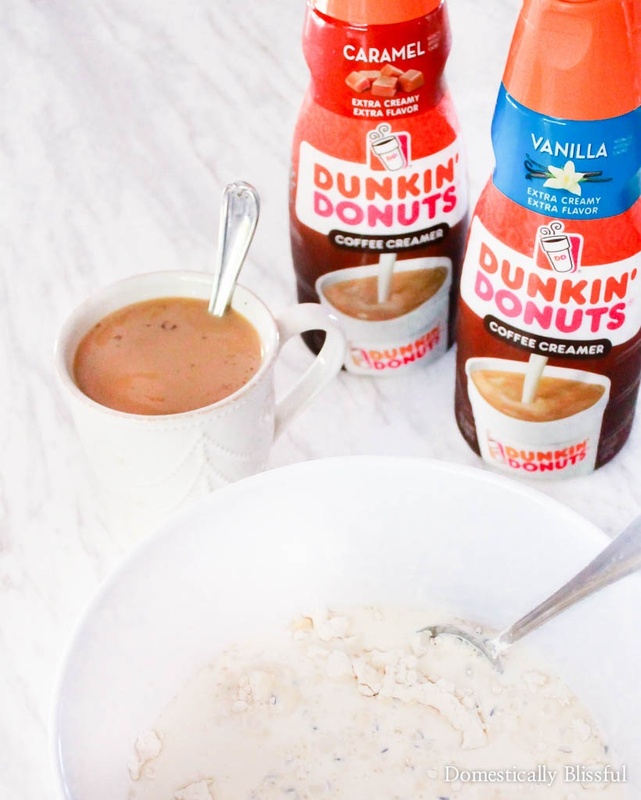 I picked my Dunkin’ Donuts® Creamer up from Walmart right before heading home with Roger after work, along with a few of the other ingredients for this tasty treat. 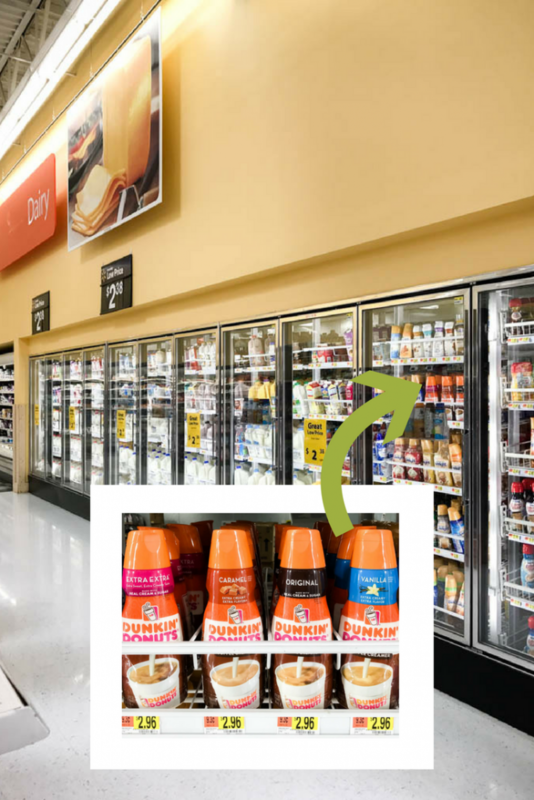 Be sure to check out all of the Dunkin’ Donuts® Creamer flavors available near you so you can start adding them to your favorite cup of summer coffee! Roger loved the flavors of these Lemon Lavender Scones as much as I did & has already asked for me to make them again! And I’m totally on board with making these over & over again! Someone recently told me that they had never tried making scones before because they thought it would be too difficult, but let me tell you, they are so easy! Which is one of the reasons why I love to make scones so often. 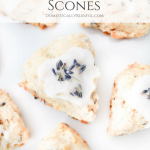 I have been creating & baking scones for years & have tweaked my scone recipe until it is just right, so even if these Lemon Lavender Scones are the first scones you’ve ever baked you know they are a tried & true recipe in our home! First, preheat your oven to 400° degrees Fahrenheit *(1), then in a bowl sift all of the dry ingredients. 2 & 3/4 cups flour, 2 tsp baking powder, 1 pinch of salt, & ¼ cup sugar. Next, stir in the zest from 2 lemons & 2 tablespoons lavender. Cut the dough into scones with a pizza cutter or big knife. 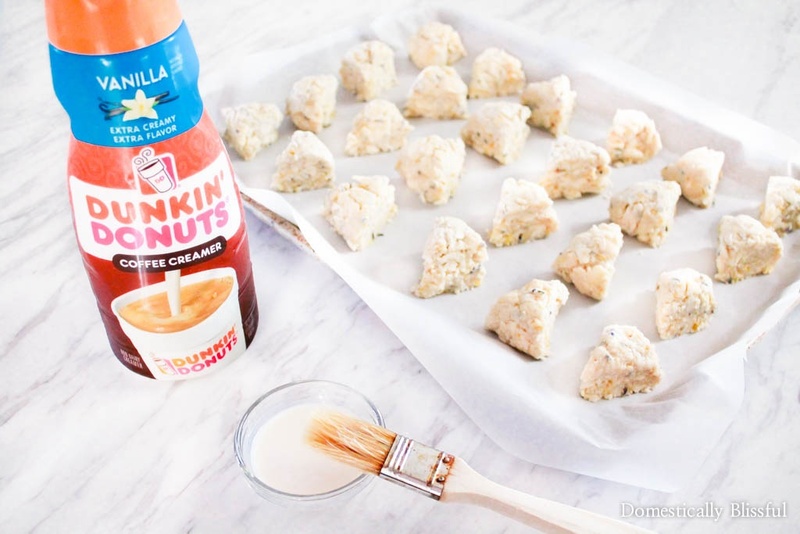 Place the scones on a baking sheet lined with parchment paper & brush the top of each scone with Dunkin’ Donuts® Vanilla Creamer. Your Lemon Lavender Scones are done baking when they are lightly golden on top. *1. If you plan on freezing the dough before baking hold off on preheating your oven. *2. You want the butter crumbles to be somewhat small, about the size of large peas, & dispersed throughout the dry ingredients. *3. Make sure that you don’t over mix, simply make sure that all of the ingredients are evenly combined to make a dough. *4. You can go ahead & shape/bake your scones if you are in a hurry, but I like to place my scone dough in the freezer for 30-45 minutes (covered in cling wrap) so that the butter gets nice & cold. That way when the scones bake there will be yummy pockets of butter in your scones! *5. The ones pictured are mini Lemon Lavender Scones. *6. For a thicker icing add more powdered sugar. For thinner add more Dunkin’ Donuts® Vanilla Creamer &/or lemon juice. What is your favorite way to enjoy Dunkin’ Donuts® Creamers? I love everything lavender! These look delicious, i cant wait to try! Wow these scones look incredible!! I love the lavendar on top, and it looks perfect to pair with a cup of coffee- yum! I am definitely giving this recipe a try sometime this summer! Thank you, Rebecca! Yes, coffee & scones are a perfect pair! Girlfriend, these sound absolutely divine! I will have to try this recipe soon! These looks so delicious! i’m a big fan of dunkin donuts products!! We don’t have DD creamers here, so is anY creamer good? Or what would you recommend in its place? That’s a bummer! Any vanilla or french vanilla flavored creamer will work well too. these look sooo good. i’m going to try them on my week off! pinning for later! These sound lovely!! Yum!! i love lavender and lemon combos. my husband loves that coffee creamer too. Thank you, Jessica! They were a delicious combination! These look and sound delicious! I have honestly never made scones before but I think I’ll have to try this out… Thanks for sharing! I hope you enjoy your Lemon Lavender Scones! These look incredible! I love the combination of lemon and lavender! I’ve never tried lavender in baking before, these look so divine!